The rise of the eur usd continues unabated at present and seems to have consigned the bad news of recent months to the dustbin of history! With yesterday’s wide spread up candle once again signalling bullish intent in the forex markets. 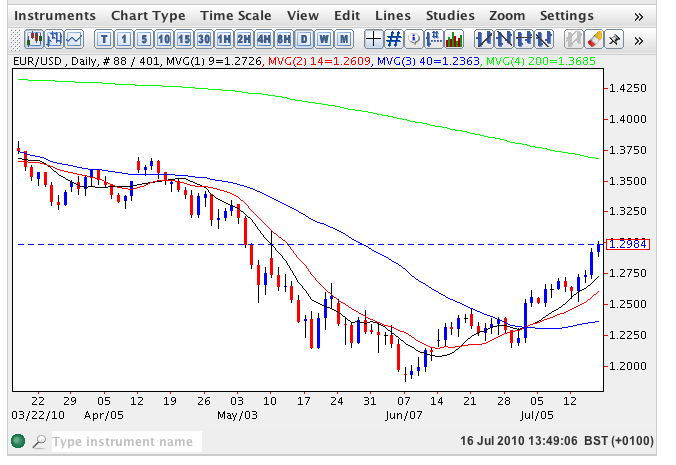 With both the 9 and 14 day moving averages providing solid support and the trend now firmly established we look set to approach the underside of potential resistance at US1.3250 where the future extent of the rally may be tested. Should this be breached then potentially we could look for the trend to continue higher where we may run into a major turning point at USD1.3679 where the 200 day moving average awaits. Longer term the outlook still remains bearish with the euro dollar still expected to re-test the recent USD1.18 low in the next 9-12 months.